'Walking Dead' Boss Debunks Daryl Morse Code Theory? The Walking Dead isn’t known for elaborate fan-sleuthing (save a dumpster-dive or two), thought it seemed impossibly coincidental that placement of a Morse Code chart and an unusual Rick-Daryl interaction weren’t intentional this past week. Well, sorry to burst your Reddit bubble, but showrunner Scott Gimple says it might just have been a sunny day. The theory gained traction online after Sunday’s “Service,” in which a noticeable Morse Code alphabet hung in the background of Rick’s home, several scenes before a mute Daryl was seen to blink repeatedly at Rick from Negan’s clutches. Granted, Norman Reedus hasn’t the most expressive eyes, and Daryl had endured several weeks of torture; the intentional shoutout to Morse Code lent at least some plausibility to the idea. I will also say that it was an incredibly sunny day. But I will say this, the fans of this show are the greatest fans that watch a television program. The stories that they tell and the things that they gleam out of it are actually really thrilling. It just excites me that they have enough faith that we have put in some labyrinth theme kind of stuff. I would love to live in a world where that was true but it also could have been a sunny day. 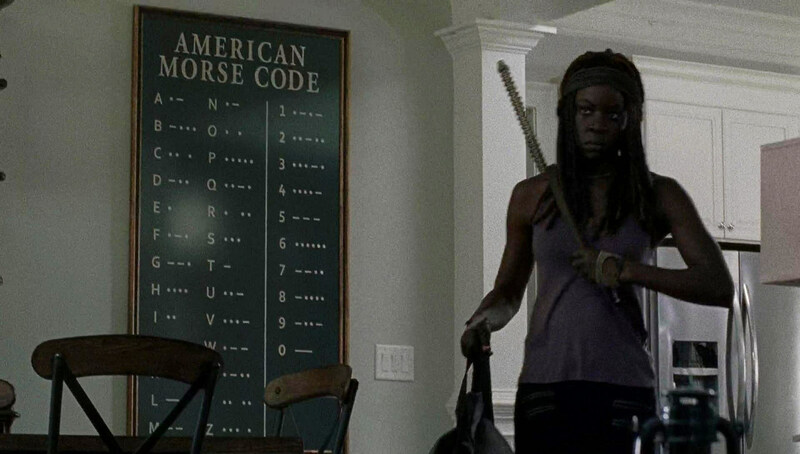 As we said, The Walking Dead isn’t generally recognized for its forethought, though the placement of that overbearing Morse Code chart seems oddly distracting, if not intentional. We’re midway through the first half of Season 7, with little insight into Daryl’s future (nothing from upcoming episode descriptions either), but is Gimple intentionally misleading fans?